What a special day for a pink & purple loving 6 year old girl! 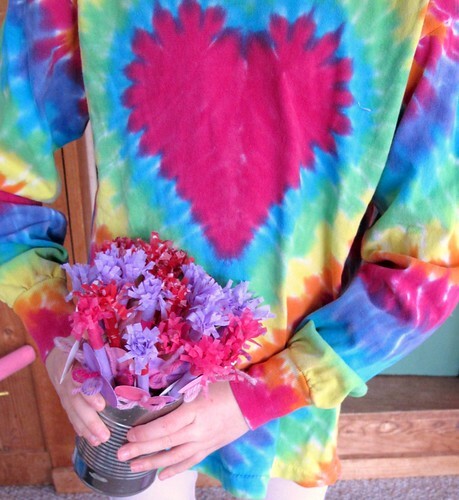 As she donned her brother's old tie-dye, she exclaimed why can't every day be like this? Well, we all know the answer... it CAN! I think I'll slip more love notes onto nightstands. Feeling cherished from the moment their eyes flutter open is something I hope my children will always feel. Right now, I have an opportunity to ensure that.. to fill them up to the brim with all I've got. I was happy to help my daughter spread some of that love to her friends today. 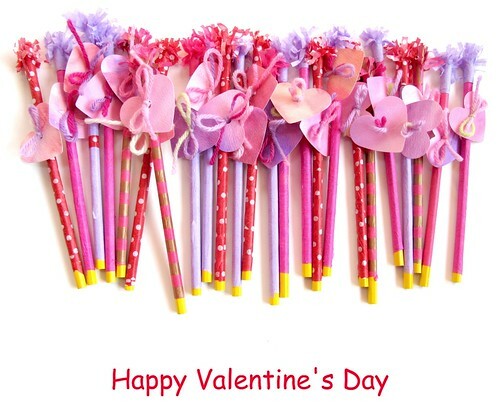 Frilled pencils roll up so easily, and her little hearts were tied on just so with favorite yarn. It's a simple choice: to live each day with love as the focus. This morning as I sent her off into the world with a bouquet of love, I was reminded, once again... teaching this to my children is my most important work. what a great belief to raise your kids by. i'm sure it will not only give them deep roots but also the biggest wings for whenever they need them! in my opinion, to express love is one of the most important things a little human can learn these days, in this world. "teaching this to my children is my most important work"
Daily acts of random kindness, that makes the world go round. You're doing a beautiful job of it, Maya. we're all just doing the best we can! even as they grow in to adults they cherish those little special somethings. My youngest is almost 18 , gasp. They were greeted with homemade valentines this morning and chocolates in new mugs and I even wrote long letters on their napkins tucked into their lunch is on mom today bagged lunches. I totally agreee. I so wish the whole world thought the same way. my name is maya too! and my favourite thing to do is craft! its really funny that i stumbled accross your blog, but i follow it. and i wanted to tell you that i love your ideas! keep on blogging because i read it and love it! thank you! Hi, I love and follow your blog, and I wanted to let you know I do a weekend post on my blog, about my favorite blogs. I wanted this weekend's post to be about your blog. Could you let me know if this would be ok, and if possible, get up with me so I could ask you a few questions for a brief interview? I would appreciate this greatly.